Vivo is set to officially launch Vivo V15 Pro on Feb 20 in India. The partial hardware specifications of the phone are already confirmed officially thanks to the Amazon India landing page. The Amazon India landing page confirms that Vivo V15 Pro features an In-display fingerprint sensor along with 32MP popup camera for selfies while there is a triple camera module at the rear. The primary sensor on the rear is a 12MP sensor which can use pixel binning to shoot 48MP images. The company is yet to reveal any details about the standard variant i.e. 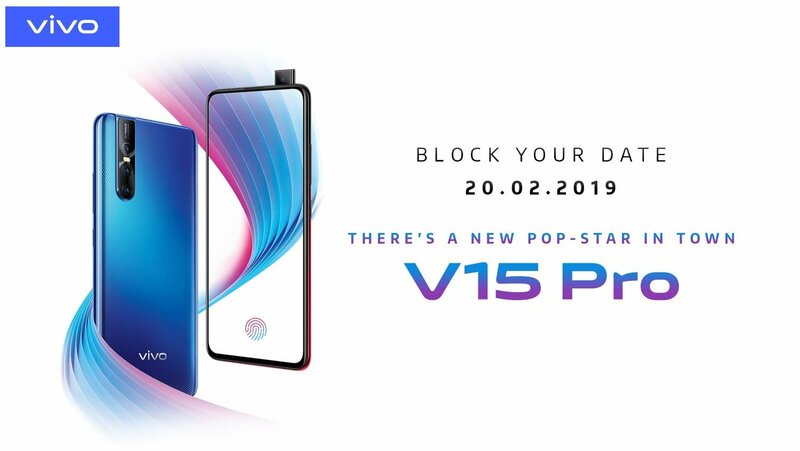 the Vivo V15 though we have seen posters which indicates that both the pro and standard variant of Vivo V15 is coming soon. We expect the standard variant to launch a few weeks after the Pro variant launch on 20th Feb.
Androidpure has received the real-life images f Vivo V15 which confirm some of the basic features of the device. As per the leaked image, Vivo V15 features triple camera module at the rear and the popup camera for selfies just the way as the Pro Variant has. But there is a significant difference i.e. the V15 standard variant features the conventional fingerprint sensor at the rear panel and there is no in-display fingerprint sensor. At the moment, we are not sure about other hardware differences between the two variants including the size of the display or the battery capacity. Based on the leaks till date, Vivo V15 Pro is expected to feature an In-display fingerprint sensor with super AMOLED display and is powered by Qualcomm Snapdragon 675 processor. If true, it will be one of the first smartphones with Snapdragon 675 SOC chip. It comes with 6GB of RAM and 128GB internal storage. In terms of camera, it features a triple camera module with a 48MP primary sensor in addition to two additional sensors of 8MP & 5MP at the rear. On the front, there is a 32MP selfie snapper in the form of a pop-up camera. Rumours indicate a battery of 3700 mAh capacity.